The eminent actor Nikola Todev was born on June 13th, 1928, in the town of Devin, Smolyan Region. He started acting at the age of 24 on the stage of the Smolyan Theatre, and later in Pazardzhik Theatre. He met his wife, the actress Zlatina Todeva, while he was an actor in Pazardzhik. Later, they both were actors at the Plovdiv Drama Theatre. In 1974, Nikola Todev became a member of the Bulgarian Film Makers Union. Hewas not only a distinguished theatre actor, but he was also a popular movie actor - he played various characters in 57 films altogether. He died on March 30th, 1991, at the age of 63. 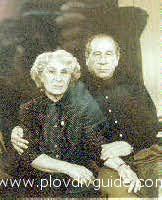 The photo of Nikola Todev and Zlatina Todeva has been taken from the article of Grigor Nikolov about the actress Zlatina Todeva - www.segabg.com, dated Nov.06, 2004. Photos in the article by Velislav Nikolov.